You’ve no doubt heard about the concerns over lead-tainted water in the Michigan city of Flint. While the city and state have declared it a public-health emergency, some big businesses are stepping up with the promise of delivering millions of bottles of clean water to Flint schoolchildren through the rest of 2016. In a joint statement, Walmart, Coca-Cola, PepsiCo, and Nestlé pledge to send 176 truckloads (6.5 million bottles) of water to hydrate the approximately 10,000 students of Flint public schools through the calendar year. The current crisis began in 2014, when Flint stopped sourcing its water from Lake Huron (via Detroit) and instead began getting it from the Flint River. The river water, more corrosive than what Flint’s old pipes had been used to, eroded the protective linings of the city’s service pipes. Shortly after the switch, Flint residents began complaining of odd tastes and smells. Subsequent tests turned up alarmingly high levels of lead in the water. Flint switched back to the Detroit water in the fall of 2015, but it will take some time for the pipes to stop leeching lead into the water. 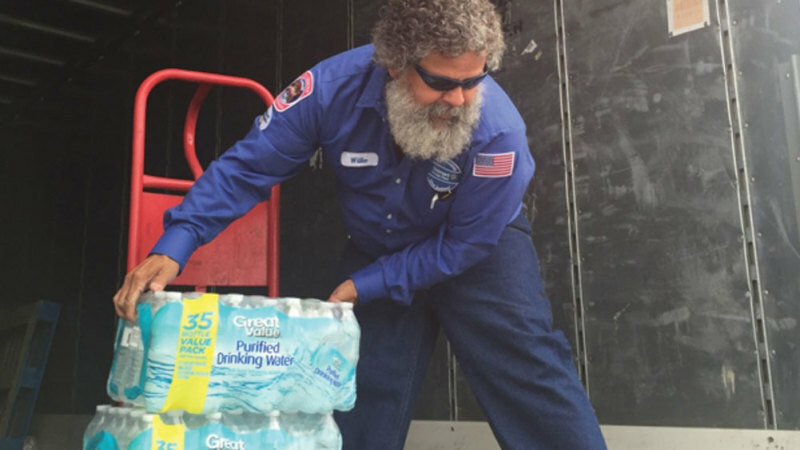 Walmart says that, since July 2015, it has donated some 504,000 bottles of water. The other companies have delivered a combined 370,000 bottles in recent months. And they are not alone; other businesses and concerned citizens have also provided free bottled water to Flint students. But as this Detroit News story notes, for all the generosity displayed through these donations, when students leave school they’ve still got to deal with the realities of tainted water at home and elsewhere.